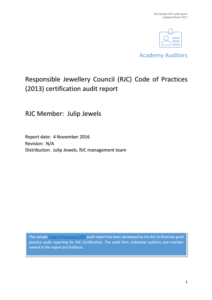 The RJC Assessment Manual sets out what must be included in audit reports for RJC standards. The Sample COP and CoC Audit Reports below have been developed to illustrate good practice audit reporting for RJC Certification. The sample audit reports are used for training with RJC Accredited Auditors. Members and stakeholders can also use these samples to better understand the audit reporting process for the RJC Code of Practices (COP) and Chain of Custody (CoC) standards. 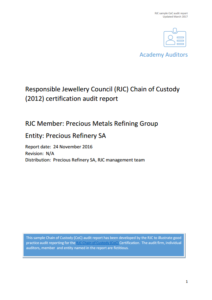 RJC reviews all Audit Reports for consistency with its reporting requirements, before issuing certification to members. The requirements of audit reports are further explained in the downloadable examples. The auditor and members in the reports are fictitious. Please note that the M&E workbook is no longer required, as long as the key data and information points are included in the audit report (number of employees etc).